Ground re-activator: Low-tech fight against landslides. The challenge: Landslides are one of the most widespread hazards on Earth. The land area at risk of landslides is 3,7 million km2 and the population exposed is around 300 million people. Landslides contribute to almost 17 % of all disaster-related fatalities and are ranked as the 7th most killing natural hazard in the world (Lacasse & Nadim 2009; Petley 2012). The most affected are the developing countries, which have less resources to recover from these disasters. The marginally stable and actively unstable soil on a hillside that causes the landslides is triggered by several factors: rainfall, earthquakes, land use and human activity, such as cultivation, excavation, and deforestation. These cause soil impoverishment and loss of sub-strata nutrients. The effects of a landslide extend from damages to buildings, infrastructure, crops, and human loss, to the devastation of the natural environment. The soil affected by a landslide takes years to settle and regenerate and the void left by the slide leaves an eternal scar on the hillside. Project: The GROUND REACT-IVATOR is a biodegradable device adopted in high-risk zones to prevent landslides or to regenerate the eroded ground after a landslide has occurred. The reactivator is composed of three essential elements: the hollow “roots”, the basin, and the interchangeable clay inserts with integrated seeds. Roots and basin are made of short-term biodegradable bio-plastic, a composite of water and cellulose that dissolve in the ground over time. The roots are designed to easily penetrate the ground, but almost impossible to extract once they are filled with soil. The sides are perforated to facilitate sediments and soil to blend while allowing water infiltration. The basin connects to the roots at the bottom and on the side. The joints are designed for a flexible and modular installation of one or multiple devices on the hill slope. The basin is also provided with holes at the bottom and on the sides to allow slow water filtration and passage of growing roots. The core of the device consists of clay inserts containing seeds. Each insert is easily transportable and fits the bottom of the basin. The inserts contain different type of seeds according to the climate they have to integrate with. They are built in 2 layers: the bottom layer contains seeds of pioneer species, while the top layer contains seeds of trees. 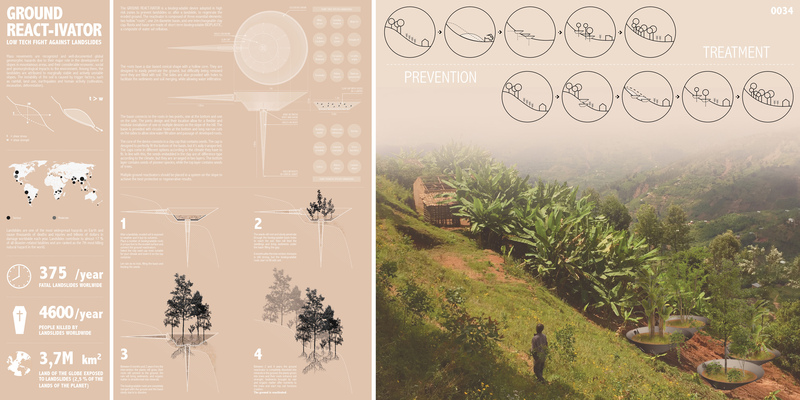 Prevention: The reactivator placed in a high-risk zone helps to prevent landslides and protects crops and infrastructure at the bottom of the hill. It slowly filtrates nutrients in the ground and captures soil that may slide from the top. 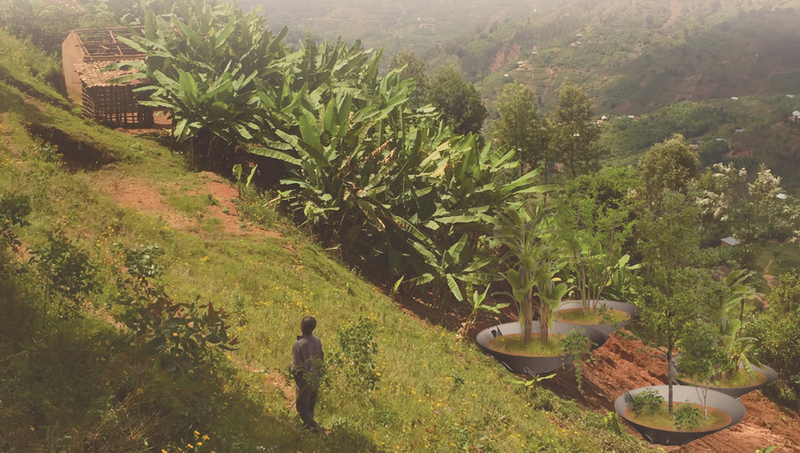 At the same time, it provides to farmers and local communities basins where specific useful plants grow naturally. Remedy: Placed after a landslide has occurred, on a poor and unstable ground, the reactivator regenerates the soil through the natural filtration of nutrients into the ground and the growth of pioneer species that will hold the ground sub-strata and restore the PH of the soil. At the same time, the basins protect from future soil slides and allow for infrastructure reconstruction at the bottom. A system of multiple ground reactivators should be placed on the slope to achieve the best protection of regenerative result.